I'm a lover of music. It's what I do for a living, it's what I do in my spare time, and it's what gets me through the day. I'm a musician, a songwriter, an audio engineer, and just plain enthusiastic about good music of all kinds. 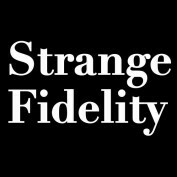 I created Strange Fidelity to share my love of music with others no matter what musical tastes. If you love music as much as I do, follow me for weekly updates to discover new music and rediscover old favorites.